Facials Chelsea: Do I Need an Oxygen Facial? Oxygen facials have been all the rage among celebrities for a decade, and now anyone can receive this powerful treatment at the right spa. At Unique Threading Salon, we love having the opportunity to provide you with a variety of innovative facial treatments, including dermabrasive oxygen facials. For individuals who are concerned about signs of aging, oxygen facials can be enormously helpful. So what is an oxygen facial, and do you need one? Oxygen facials involve using a small device called an airbrush to blast pure oxygen (a.k.a. hyperbaric oxygen) directly onto the face. Because the airbrush uses a high pressure, the oxygen reaches deeper under the epidermis (the outermost layer of skin) so that it can be absorbed more effectively. This is what makes oxygen facials different than many other types of facial — in most facials, the molecules of the beauty product are too large to pass through the deeper layers of skin. Exercise offers a variety of benefits, but one of them is that improves the health and appearance of your skin. This is because exercise oxygenates your body, giving it the oxygen it needs to do a variety of things for your health. Oxygen facials send oxygen directly to your skin, which is especially helpful for anti-aging properties because as we get older, oxygen levels in your facial skin naturally decline as blood circulation becomes worse. What Does an Oxygen Facial Feel Like? Because oxygen facials aren’t non-invasive, they aren’t painful. Most people describe it as feeling like you have a tiny pressure washer spraying cool water on your face. However, because we perform microdermabrasion before this process you might find it a little more uncomfortable. We offer the microdermabrasive step because it removes dead skin cells and cleanses your pores, which makes the oxygen treatment more effective by allowing it to penetrate even deeper. How Long Does an Oxygen Facial Last? After the first treatment, the results of your oxygen facial last about a week. However, the effects are cumulative, which means that the more oxygen facials you receive, the better your skin looks over time. We recommend one oxygen facial a week for six weeks, which offers results that last for three months. After that, once a month should be sufficient to maintain the youthful appearance of your skin. Of course, this is up to you to decide. 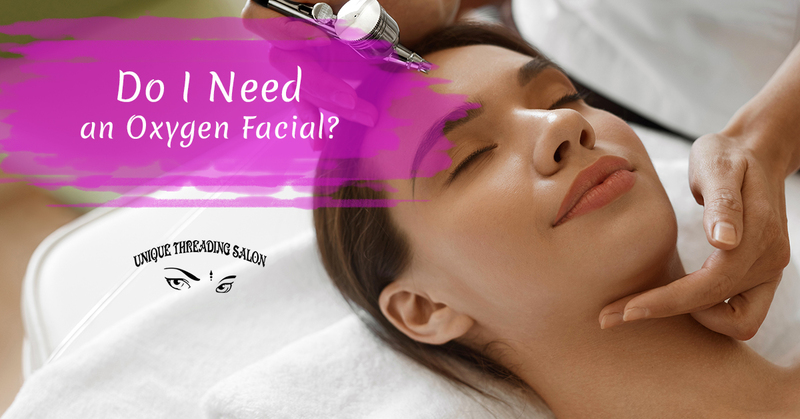 You may decide you want to receive an oxygen facial if you are looking for anti-aging skincare that smooths wrinkles, kills acne bacteria, and hydrates the skin. However, you may want to skip an oxygen facial if you have sensitive skin, as for some people, it can cause inflammation. At Unique Threading Salon, we offer a selection of luxury facials, including dermabrasive oxygen facials. When you’re ready to try an oxygen facial in Chelsea, contact us!